Ideal for connecting PC Din5 port and device with DIN 5 (AT) port. Ideal for extending your DIN5 device such as AT mouse or keyboard. Ideal for connecting keyboard or mouse to KVM switches. Fully shielded with Gold plating contacts to prevent unwanted EMI/RFI interference. Ideal for extending your mouse or keyboard cable or replacing your old one. Fully shielded with Gold plating contacts to prevent unwanted EMI/RFI interference. 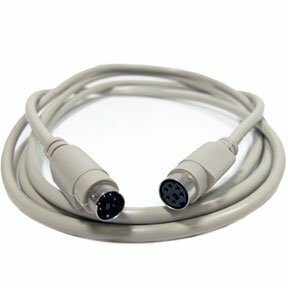 We have PS/2 connectors for connecting keyboards and mice to PC. Din5 connectors are used for connecting older (AT) port keyboards, joysticks and other devices to PCs. We have a range of keyboard and mouse cables available at SF Cable. We have Din5 M/M 5C Straight Thru Cables, Din5 M/F 5C Straight Thru Extension Cables, PS/2 MDIN-6 Male to Male Keyboard/Mouse Cables, M/M Keyboard/Mouse Cables, M/F Keyboard/Mouse Extension Cables, and other products. You can find all cables in different lengths and choose from the one that suits your requirements. We offer all products at competitive prices by eliminating the middlemen costs. All products are sourced from ISO 9001-2000 registered manufacturers which ensures the quality of the product. All products are duly tested for safety before they reach you.